Belaying a leader in a climbing gym with a Gri-Gri requires some skills you won't have learned if you've only belayed with ATC-type devices. Luckily it's not hard to make the adjustment. 1. 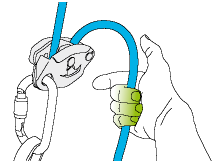 Hold the rope with at least three fingers. 2. 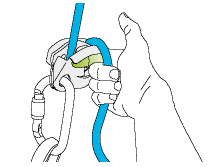 Use the index finger to support the GRIGRI. 3. The thumb presses on the cam. The big thing to learn is how to momentarily allow rope to be pulled through the GRIGRI without blocking the cam's action. 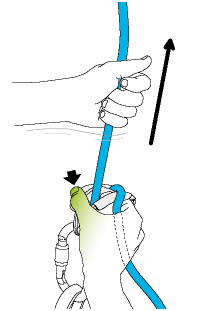 Hold the rope with at least three fingers. The thumb presses on the cam. The action must be momentary, and as soon as the leader has clipped return to the primary belaying position. More of a visual learner? Have a look at the official Petzl video.